TECHNOgates manufacturers automated boom gates for both the commercial and industrial sectors. We can custom make boom gates for your needs, so please contact us and we will tailor a competitively priced solution for you. TECHNOgates is one of the leading boom gates providers in Melbourne and we supply and install boom gates in various Melbourne suburbs including country towns such Ballarat, Geelong and Bendigo. Boom gates are extremely useful as security tools and they greatly enhance the security level of your property. 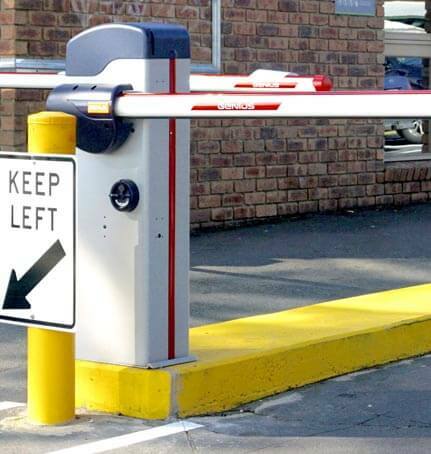 We can provide top quality and highly durable car park boom gates for your commercial properties located in Melbourne. If you own a shopping mall, residential apartment, hotel or resort, business property or any other similar set-up in any other Melbourne suburbs or country towns in Victoria, We can control the entry and exist of vehicles with our car par boom gates and access control systems. As experienced and trained boom gates and access control systems , we provide excellent boom gates products and installation and after sale services as well. We can custom design your boom gate so it works perfectly as per your requirements and the specifications of your building. We do manufacture automatic Sliding boom gates for councils and comman properties such as parks and grounds. We can provide manual and automated boom gate installation for all kinds of properties. Where manual boom gate requires you to assign duty to a security guard to operate the gate, automated boom gates can also operate using sensors or can be remote controlled from an internal control room. Boom gates can also be installed to control traffic on foot. These boom gates are smaller and are commonly found in subways. These also help in controlling foot traffic in addition to enhancing your property’s security. Whatever kind of boom gate you require, we have the expertise to meet your requirements. So give us a call today at Technogates, your number one provider of gating solutions in Melbourne. Are you searching for a boom gate in Mulgrave? Then look no further than TECHNOgates. With a huge amount of experience behind us, we will ensure that you choose the right gate for your property. This means finding out what you need from a gate and access system and how much traffic is coming in and out. A boom gate in Bayswater or Dandenong will help regulate who comes and goes, offering a different kind of security than a traditional sliding gate. Perfect for businesses that see a lot of traffic, this is a great way to monitor customers, visitors and staff. To learn more about a boom gate in Tullamarine or Moorabbin, contact our team today or call us on 1300 923 224 to speak to an expert now.